I get to visit a lot more parks with Newton around town and it's a great opportunity to do some quick sketches and test various pens. This time I used some random gel pens. 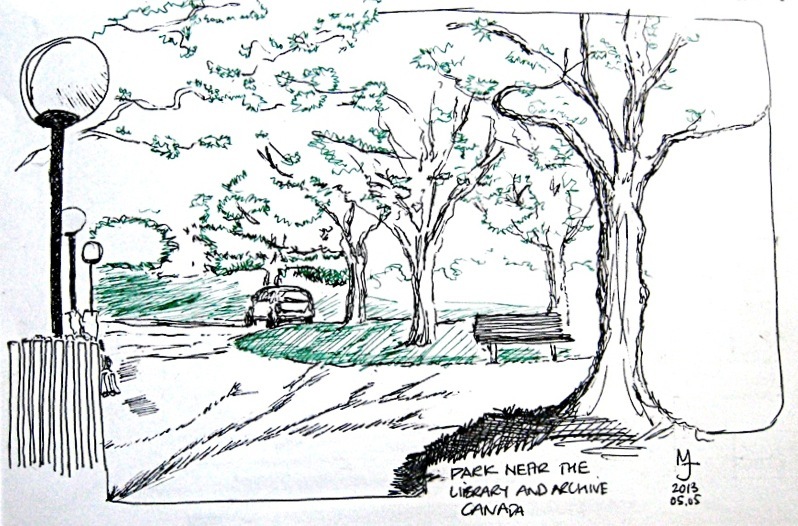 This little park is located near the Supreme Court of Canada. There wasn't a lot of people around when we were there on a Sunday afternoon. There are a couple benches for people to sit down. Some of the benches are oddly high for some reason (my feet couldn't touch the ground and I'm not short!). I wonder what's the story behind that. There's also a focal point (not shown in the drawing), where the yearly tulips are getting ready to show their colours. I noticed it as we were leaving. Maybe I'll go back and draw them next time.